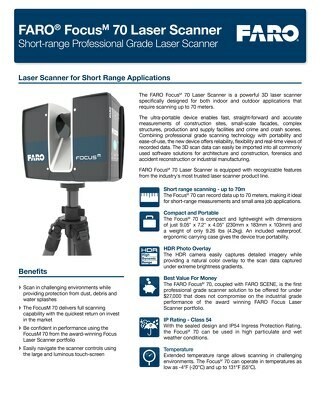 FARO® SCENE software is specifically designed for all Focus, Freestyle and third-party laser scanners. Process and manage scan data efficiently and easily by using real-time, on-site registration, automatic object recognition, scan registration and positioning. Generate high-quality data in full color quickly and conveniently by incorporating images from automated targetless and target-based scan positioning. Users can begin the evaluation and processing immediately by performing simple measurements, creating stunning 3D visualizations or exporting to various point cloud and CAD formats once SCENE has prepared the scan data. In addition, SCENE features an impressive Virtual Reality (VR) View, allowing users to experience and evaluate captured data in the VR environment. This software serves various application including architecture, engineering and construction, surveying, public safety and forensics, reverse engineering for product design and virtual effects for movies, games, etc. BuildIT Construction is an integrated building lifecycle Quality Assurance and Quality Control (QA/QC) tool to continuously evaluate projects with real-time comparisons against CAD with 3D scan data. BuildIT Metrology is the industry’s leading large volume metrology software solution for real-time inspection, assembly and alignment applications. BuildIT Projector is an intuitive software to generate, plan and operate laser projection workflows, able to create and run laser projection jobs in no time, as well as perform part verification. FARO RevEng is a user-friendly 3D point cloud capture, mesh generation and advanced editing software solution that offers an array of powerful tools for processing mesh models quickly and efficiently. Regardless of how accurate the Laser Tracker is, the quality of the measurements is directly affected by the precision of the target. FARO Spherically-Mounted Retroreflectors (SMRs) provide accurat.. 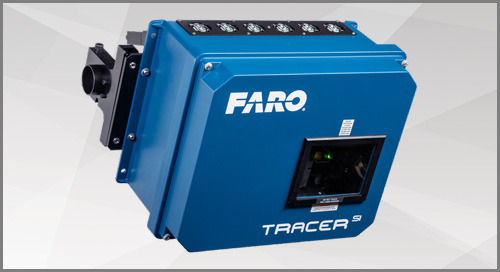 The Vantage S6 and Vantage E6 Laser Trackers deliver 6 Degrees of Freedom (6DoF) measurement capabilities via the optional FARO 6Probe, enabling access to hidden areas and small features. The Tracer SI Imaging Laser Projector is a 3D projector with advanced laser imaging for guided assembly and in-process verification (IPV). 8-Axis Design ScanArm 2.5C is an integrated remote axis portable 3D visualization and rendering solution, measuring in color for 3D modeling, reverse engineering and CAD-based design applications. 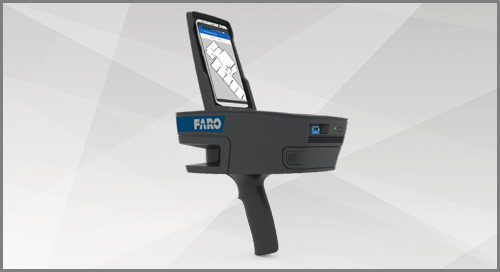 The Quantum E FaroArm offers an entry-level portable 3D measurement arm solution for organizations looking for a cost-effective, user-friendly and efficient factory inspection system. The Quantum M FaroArm offers an excellent price/performance ratio in a 3D measurement arm solution for maximizing manufacturing productivity and quality control efficiencies. Attach the optically-superior blue laser FAROBlu or high-resolution, 3D color PRIZM Laser Line Probe to the Quantum FaroArm for an all-in-one contact/non-contact portable measurement solution. 8-Axis Design ScanArm 2.0 is a portable 3D measurement and design arm for 3D modeling, reverse engineering and CAD-based design applications across the product lifecycle management (PLM) process. The Quantum S FaroArm delivers high accuracy to meet even the most challenging of tolerances with best-in-class performance for both hard probing or laser scanning applications. The Focus M and S Laser Scanners are for short, medium and long-range applications, to capture real-world information used in the digital world to analyze, collaborate and execute decisions. Factory Robo-Imager Mobile (FRIM) combines optical 3D measurement and robot technology on a mobile station to automate digitization, inspection and verification of parts at any point of production. The Super 6DoF TrackArm combines the long range, high accuracy capabilities of FARO’s Laser Tracker with the flexibility and consistency of the FaroArm® and/or ScanArm to measure hidden points. FARO As-Built Suite is a product bundle for AutoCAD and Autodesk Revit, that accelerates the evaluation of laser scan data by providing a complete set of powerful point cloud processing tools.